MLB Draft Day is upon us, and SoxProspects.com has you covered with everything you need to prepare for the draft. This week, Mike Andrews previewed some of the Red Sox's possible draft selections, and the latest SoxProspects.com podcast featured Fangraphs' Lead Prospect Analyst Kiley McDaniel discussing who might be in play for Boston, which has the seventh overall pick in the draft. In other draft preparation news, WEEI.com's Emily McCarthy wrote about Cherington's thoughts heading into Monday, as the GM said "The number seven pick in 2015 is another opportunity to [add talent], but we don't need to put more weight on it than we need to." Ryan Hannable of WEEI.com examined new Director of Amateur Scouting Mike Rikard's thoughts as he heads into his first draft at the top of the Red Sox's scouting department, and also took a look at the scouting process behind choosing a No. 7 pick. The Providence Journal's Brian McPherson says that even with a high draft pick, the Red Sox are unlikely to grab an ace on Monday. Also from the Providence Journal, Tim Britton looks at the Red Sox's philosophy and whether it differs with a top-10 pick. SoxProspects.com's Nick Rabasco wrote about the recent hot streaks of the SoxProspects.com players of the month, Rafael Devers and Aaron Wilkerson. In transactions, reliever Joe Gunkel was traded to the Orioles in exchange for Alejandro De Aza and cash considerations. 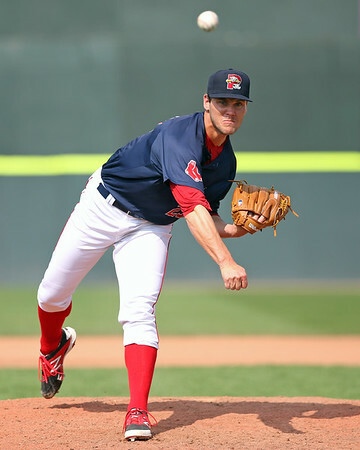 Gunkel was recently promoted to Portland, posting a 3.93 ERA in 18 1/3 innings with the Sea Dogs. 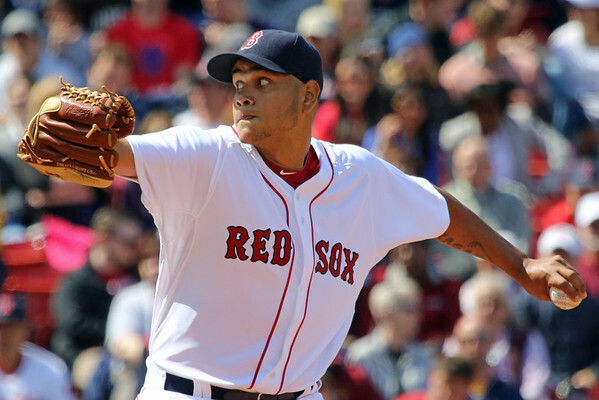 Eduardo Rodriguez (pictured, right) has solidified his place in the Red Sox rotation after another stellar outing this past week. WEEI.com's Rob Bradford gives some insight on Rodriguez's journey to the majors and spoke with Calvin Maduro, the Orioles scout who signed Rodriguez. MLB.com's Ian Browne took a closer look at Rodriguez's historic start and just how good the 22-year-old has been for the Red Sox. On BaseballAmerica.com, DSL Red Sox righty Anderson Espinoza was rated as a "helium prospect," as the staff wrote about the 17-year-old's 2015 debut and what makes Espinoza such an exciting young prospect. Over at Baseball Prospectus, evaluator CJ Wittmann gave a scouting report on Trey Ball, who he says "has the tools and ingredients to become a backend of the rotation starter," in their Eyewitness Account. Younginer (pictured, left) was huge for the Sea Dogs this week, pitching multiple perfect innings on two occasions in what turned out to both be one-run wins for Portland. The righty tossed 2 2/3 frames to hold the Sea Dogs lead in Sunday's 6-5 victory. Travis may not have shown a whole lot of power in this recent stretch of hot hitting, but he sure has been getting the bat on the ball. Travis has hit in five straight games, and has failed to get multiple hits in a contest just once this past week.